Clairemont Equipment has been satisfying Southern California's equipment needs since 1970. 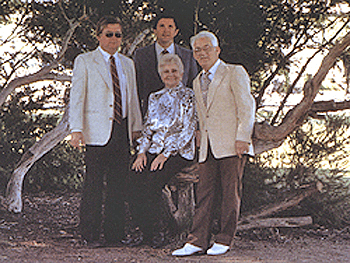 In 1970, Charles and Clara Zagami along with their two sons Ron and Jerry, shared a vision for the future and bought the A-Z Rentals franchise in the Clairemont Mesa suburb of San Diego. Initially specializing in party goods, medical equipment and small homeowners equipment; their vision was of a much larger company. A few days later the company changed its name to Clairemont Equipment Rentals and added several brands of small and medium sized equipment to their product line, and their vision was becoming a reality. The Company incorporated in 1974 as Zagami Inc. while retaining the Clairemont Equipment Company name that it was identified with. In 1974 the Company purchased a vacant lot located at 4726 Convoy Street and built a larger rental store to serve homeowners and the construction industry with general construction supplies and equipment. Following completion of the building, Clairemont Equipment established their first major equipment distributorship with the Bomag Compaction line. Their success with Bomag paved the way for the Company's expansion with other equipment franchises. In 1987 they purchased the Dresser Heavy Construction Equipment factory store and became the sole distributor for San Diego and Imperial Counties. Then In 1991 they were proud to become the Authorized dealer for Komatsu Construction and Mining Equipment when they purchased the assets and marketing rights for San Diego and Imperial Counties. In 1993, Clairemont Equipment purchased the Massey Ferguson/Fermec tractor franchise, which is known today as Terex, once again expanding the companies product line in San Diego County. Since its inception, our Company has remained focused on its commitment to provide quality products supported by superior customer service. The success of Clairemont Equipment is due to the Zagami family vision, backed by personal commitment and the collective efforts of our dedicated employees. Teamwork and a commitment to excellence has allowed us to earn and preserve the trust and confidence of our customers. Clairemont Equipment strives to serve its' customers by holding to our commitment of quality products and service by making substantial investments in our product lines, accessible facility locations and expanded services. Through the years we have continued to expand. Today we have locations in San Diego, Escondido, Fontana (Riverside & San Bernardino area), Imperial and Indio California. We are proud to represent only top of the line equipment manufacturers and stand ready to service all private and governmental sectors. We are currently Authorized Dealers for many leading brands including Komatsu Construction and Mining, Komatsu Forklift, JLG (SkyTrak), Stihl, Yanmar, Atlas Copco, Avant, Terex, and Gorman Rupp. Thanks to the vision of the Zagami family we are now enjoying the representation of 3 Generations of Zagami's as well as a strong and loyal customer base. Clairemont Equipment would like to thank all of those who have put their trust in us allowing our vision to become a reality.